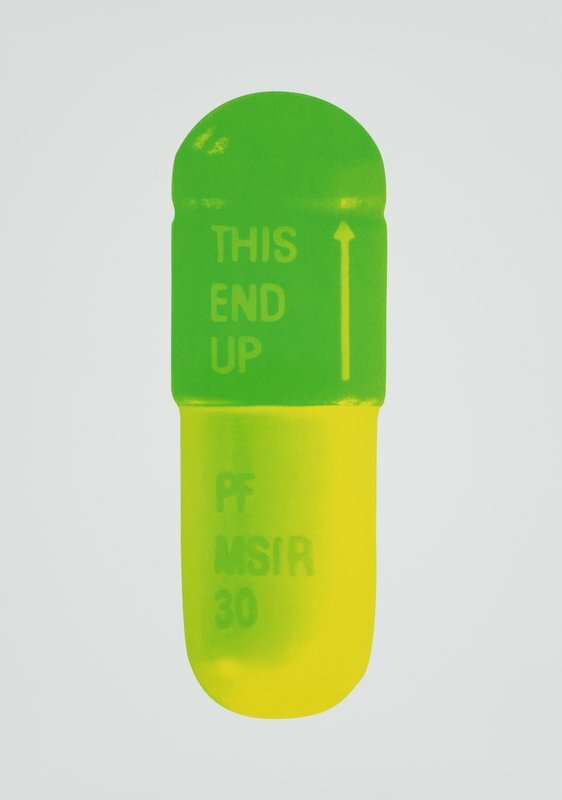 Predominantly based upon the minimalist aesthetic of the medicinal pill, the works on display act as a continuation of Hirst’s life-long investigation into our almost-spiritual relationship with the rigors of science and the pharmaceutical industry. The Cure’; is a set of thirty silkscreen prints, each depicting a two-colour pill set against vibrant backgrounds of pop-candy colors. Hirst’s enduring exploration of contemporary belief systems; religion, love, art and medicine. The manipulation of scale, is just one of the techniques employed by the artist to analyze the confident aesthetic of the pharmaceutical industry. Whilst in his second year, Hirst conceived and curated ‘Freeze’ – a group exhibition in three phases. The exhibition of Goldsmiths students is commonly acknowledged to have been the launching point not only for Hirst, but for a generation of British artists. For its final phase he painted two series of coloured spots on to the warehouse walls. Hirst describes the spot paintings as a means of “pinning down the joy of colour”, and explains they provided a solution to all problems he’d previously had with colour. It has become one of the artist’s most prolific and recognizable series, and in January 2012 the works were exhibited in a show of unprecedented scale across eleven Gagosian Gallery locations worldwide. In 1991, Hirst began work on ‘Natural History’, arguably his most famous series. Through preserving creatures in minimalist steel and glass tanks filled with formaldehyde solution, he intended to create a “zoo of dead animals”. In 1992, the shark piece, ‘The Physical Impossibility of Death in the Mind of Someone Living’ (1991) was unveiled at the Saatchi Gallery’s ‘Young British Artists I’ exhibition. The shark, described by the artist as a “thing to describe a feeling”, remains one of the most iconic symbols of modern British art and popular culture in the 90’s. The series typifies Hirst’s interest in display mechanisms. The glass boxes he employs both in ‘Natural History’ works and in vitrines, such as ‘The Acquired Inability to Escape’ (1991), act to define the artwork’s space, whilst simultaneously commenting on the “fragility of existence”.